The weight of raising another human being, passing on your knowledge, loving them, and disciplining them in a way that won’t scar them for life is much easier said than done. We have teenage daughters in our household, and last year, we added a new baby boy to the mix. It’s more important to me than ever to ensure that I spend quality time with each one of them, but in particular, this new son of mine. Many of those things are good (and some unavoidable) but they can also control you and take away from what truly matters. One thing that I’ve struggled with is balancing all of it. How do I work late hours, get proper sleep, find time to do household chores, write for Lifestyle Frisco, spend time (quality time) with my wife, play taxi around Frisco for the older kids, and find engaging activities to do with my new 1-year-old son? That last one is a struggle in particular because I want to be creative enough to do something that will help him in his development. Father-son time is important and will look different as he grows. I’ll need a range of ideas, beginning with these early years and into his adolescence. I feel inspired now, as a first-time Dad to a son. So, I’ve researched this great town of ours and come up with these suggestions for quality father-son time! Whether your son is little or nearly grown, there’s something here for you. Young children have a lot of energy – more than we can even imagine. Young boys, in particular, have even more energy than they even know what to do with. Being outside can be such a healthy form of release and has many benefits for their not only physical development but mental development. 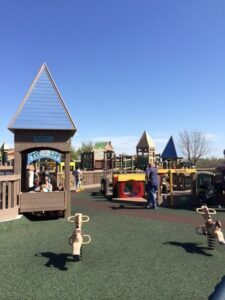 Hope Park in Frisco is the perfect spot to take your little guy and provides everything for you and your son to have a great day outside. From swings, climbing walls, slides, tire swings, teeter-totter, and more. With a rubber ground, this is perfect for children of all ages but especially those youngest ones who haven’t quite found their sea legs. A feature that separates Hope Park from other playgrounds is the ‘sensory area” which helps develop skills like hand-eye coordination, sight and more. Hope Park and the adjacent Friendship Park really do give parents options for children of all ages, and there’s ample space just beyond the play structure to throw a ball and a large pond to go fishing. Chances are that you at some point in your life (maybe it’s now), you played arcade or video games. Maybe it was Atari, Nintendo, Genesis or PlayStation, more than likely you spent a lot of time pushing those buttons. Things haven’t changed that much today – video games remain a huge part of children’s lives (the systems and graphics are better, though!). 28% of video game users are under the age of 18 and most of them are boys. These numbers will only grow, I would imagine, as the accessibility of gaming grows with our smartphones. The NVGM offers a great experience for all ages. 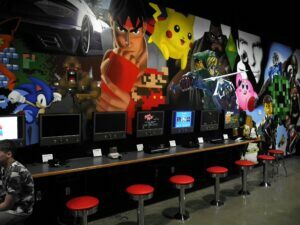 With an interactive history of video games and systems, the museum allows you to play games that many young kids have only read about. There’s also an 80’s style living room that will take you back to your childhood while showing your son a fun piece of history. Football fan? The Star in Frisco is a football-lovers paradise. 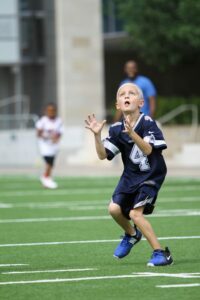 Even if you’re not a Dallas Cowboys fan, you and your son can enjoy throwing passes on the Tostitos Championship Plaza field in front of the Ford Center. The field is active with fans and visitors every day of the week, at all hours. Frisco ISD plays games inside the Ford Center, and the Dallas Cowboys hold a number of pre-season practice sessions there. Add to it the cool restaurants on site like The Common Table and City Works, and you’ve found yourself a great place to watch sports, play sports, or shop sports. History can be fun (even though most kids will roll eyes and say that it’s boring). The Frisco Heritage Museum is a great place to learn about the past and the development of Frisco. Look at homes and buildings from a time when was no FC Dallas, Dallas Cowboys Headquarters or Frisco Square, is actually pretty fun. See The Caboose, an old steam locomotive, and learn about the rich railroad history. While you’re there, purchase tickets to the Museum of the American Railroad, which is now home to the Traintopia exhibit! Consider these other family-friendly train-related activities in Frisco, as well! I know what you are thinking… Cigars and kids? No, of course not. But little boys don’t stay little boys forever and one day, your son will grow to be an adult. This is where you begin to truly connect and be friends, and enjoy the conversations about football, soccer, music, family, and more. 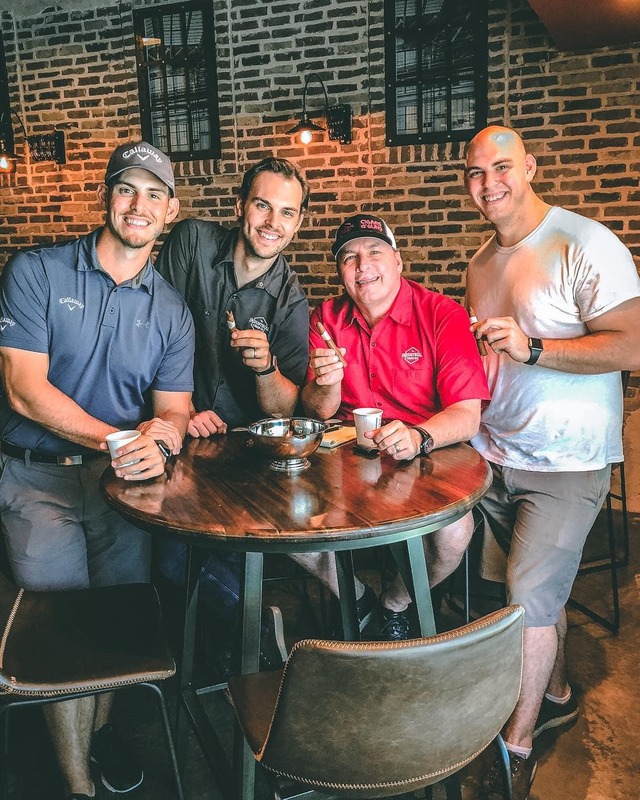 For many local residents, Industrial Cigar Co. has become a home away from home to connect with others and enjoy a break from the pressures of life and work. With a massive cigar selection and staff that will make you feel like family, they’re also happy to provide you with a little Cigar 101, should you need it. Open 354 days a year, the location has a cool industrial design, very comfortable seating, and fast WiFi . “Cigar Culture” will make it very easy for you and your grown son to have a quality conversation, to relax or engage together in a larger group conversation. Just ask the owners…a father and sons team who know this first-hand. Frisco is a sports-enthusiasts’ paradise and loaded with opportunities to catch a game! FC Dallas, the Texas Legends, the Texas Revolution, Dallas Stars practice sessions, Dallas Cowboys training camp, the Dallas Rattlers, the Frisco Roughriders, and the Dallas Rattlers. Just recently the National Soccer Hall of Fame opened here, and Frisco hosts several huge annual events such as the Frisco Bowl, and Frisco Classis Baseball Tournament. We’re also home to several charity match-ups like the Red River Celebrity Softball Game and the Dirk Nowitzki Heroes Celebrity Baseball Game. It sounds like a chore, but in the end, running together can be a great way to bond. Register for a 5K or a half-marathon and set a pace goal together. Getting ready for the race could involve evening or Saturday morning runs, and before you know it, you have a new shared activity. Check out our list of events in Frisco by season. Did you know Frisco has a number of ponds that are stocked with fish? Grab some poles, a sack lunch, and learn to fish! Fishing is one of those great activities that you can enjoy from early childhood into your elderly years. Frisco has an annual Trick-a-Trout event each February that makes for a great annual Father-son (or Father-Mother-daughter) tradition. What you do with your son is not nearly as important as simply investing time with him. Not only do you hope to teach your son, but you might learn quite a bit from him, as well. My son recently turned one year old, and until now, it never occurred to me though that he could teach me? The reality is, he’s been the best teacher and some of the things I learned are lessons beyond his understanding. So Frisco Dads, take time to be the Dad. Work can wait a little bit regardless of bills and house projects can wait awhile, too. Frisco offers so much to do and the options are always growing. But you don’t need an elaborate plan to make something memorable – you just need to make the time.